EltaMD Facial SPF 30- Ideal for all skin types, especially moderate to dry skin. Provides UVA & UVB protection. EltaMD UV Lotion SPF 30 (Body) – This is a moisturizing sunscreen for the entire body. It can be used daily to guard against sun-damage by applying liberally 10 minutes before sun exposure. It is safe and effective for all skin types. Elta Daily SPF 40– This is a sheer, light weight moisturizing sunscreen specifically formulated with hyaluronic acid to reduce the appearance of fine lines and wrinkles. It glides on easily and absorbs quickly into the skin. Elta Elements SPF 44- This is a 100% physical sunscreen in a tinted, moisturizing base. Its chemical-free actives, zinc oxide and titanium dioxide, provide safe sun protection. Elta UV Aero SPF 45– This continuous spray sunscreen with transparent zinc oxide sprays on white so you can be sure of coverage then dries clear. It provides fast and convenient sun protection for children and adults and is water-resistant for up to 80 minutes. Elta UV Clear SPF 46- Formulated with high-purity niacinamide (vitamin B3) to help reduce the appearance of blemishes, discoloration, and photo-damaged skin. This is extremely lightweight and contributes to maintaining smooth, clear skin. This is ideal for acne prone skin. Elta UV Pure SPF 47– Formulated with purely physical (not chemical) active ingredients which are photostable. Delivers broad spectrum protection against UVA (aging) and UVB (burning) rays. Water resistant up to 80 minutes. 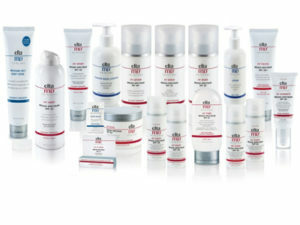 Elta Sport SPF 50 Specially formulated for active lifestyles. It is great for athletes, swimmers and children because it is very water and sweat resistant and won’t run into the eyes. Water resistant up to 80 minutes. Elta Cream – This is a cream that melts on contact to skin and provides superior long term moisturizing power for severe, dry skin conditions. Also great as an eye make-up remover. EltaMD Lotion Used as a daily moisturizer for the face, body and hands. Safe for sensitive skin. Apply throughout the day. EltaMD Moisture Rich Body Crème– EltaMD Moisture-Rich Body Crème infuses dry, flaky, sensitive skin with long-lasting moisture and essential nutrients. It is the ideal daily moisturizer to help achieve and maintain healthy-looking skin. EltaMD Foaming Facial Cleanser– A gentle enzyme and amino acid blend in this product loosens makeup, excess oil and other impurities on the skin and in pores. Contains no harsh surfactants reducing drying and irritation. Safe for all skin types.